I'm a conservative gal. And I don't mean politically, I mean fashionably. My mother is a children's wear designer. Last time I visited her in Manhattan, she invited my boyfriend and me to a hip restaurant in Soho and, on calling her as we approached, leapt from the doorway of the restaurant in a pair of shearling-topped Eskimo boots and a short, like, floofy, patterned dress, glittering bangle-laden arms waving overhead. I'm pretty sure Andy was wearing a canvas Carhartt jacket and I was in black Converse and a white T-shirt. She thinks I'm in a permanent gray and beige fashion purgatory and once bought me a hooded sweater ornamented with what seemed like a hundred tiny mirrors. "Wow, it has...mirrors....all over it." "Well, you know honey, I'm sure its you, just give it a chance. For such a young girl, you're in a real fashion rut." 1. I love stockinette and garter stitch. 2. 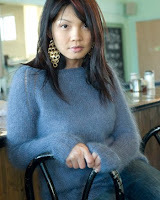 I love to knit cables, but I can't tell you the last time I wore them. 3. Colorwork gives me agita. It has nothing to do with the technique, but when it comes to picking colors, the room spins. 4. I've only ever used variegated yarn for socks. I tried a hat once, but got too nervous and frogged it. 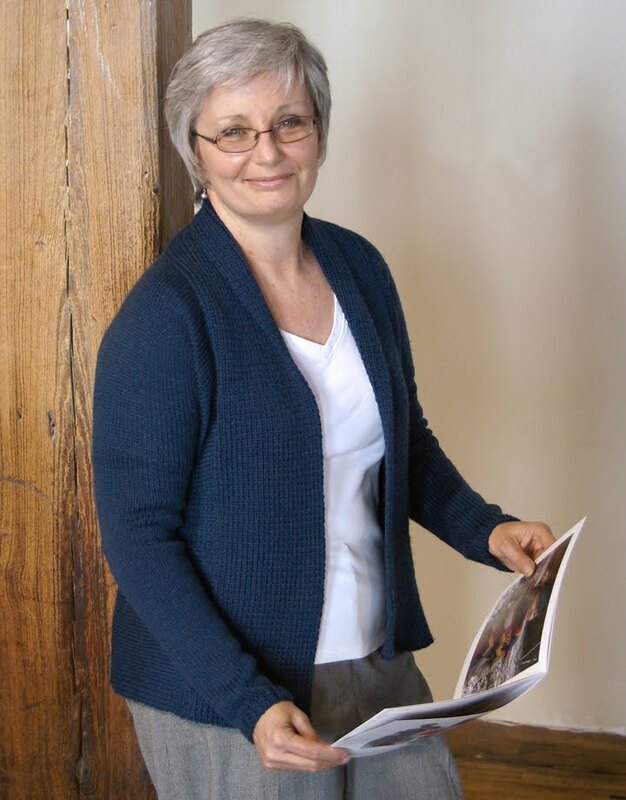 That being said, let's examine the Elizabeth cardigan. I tried it on at WEBS and could have been toppled with a feather I loved it so much. 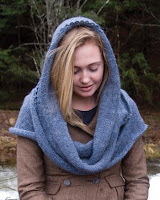 The stockinette! The side-to-side construction! Oh, the 1x1 rib! I swooned. But the striping was too much for my delicate constitution. In the car on the way back, I said, "Man, I love that cardigan! But is it weird I want to make it in a solid?" To my endless gratitude, Betsy responded, "I really want to make it in black for everyday wear, actually!" 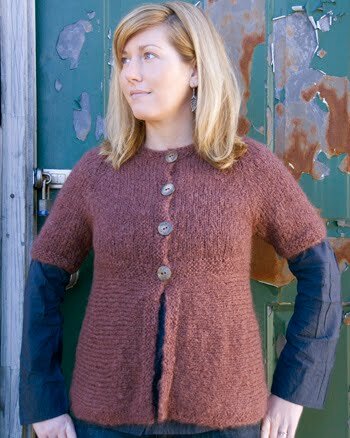 And thusly, two solid colored Elizabeth cardigans were born--Betsy's in black, and mine in a lovely gold hue. Knitting Elizabeth in a solid takes it out of "statement" realm and straight into "regular day". The slip-stitch pattern at the lower back has a tailoring effect which makes it look a bit more formal, but the open front and squishy wide ribbed collar makes it the perfect jeans and a t-shirt sweater. For any who were skeptical of striping yarns, take a second look at Elizabeth in color #7846, deep teal. You can find the color card on our website. Who knows, when I'm done maybe I'll put on some bracelets for you, Mom. I love this video--a young girl vanquishes a fiber monster with her knitting needles! I've definitely found comfort in disappearing somewhere with a mess of yarn and some needles and losing myself...This video is such a great metaphor! 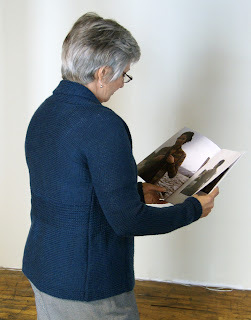 Thank you to one of my favorite blogs, the Fiber Arts blog at the Times Union in Albany, NY for posting it first. Another technique post for you! Our Web-Letter this week features a beautiful scarf and mitten set knit in Inca with light and medium blue embellishments added after the pieces are complete. 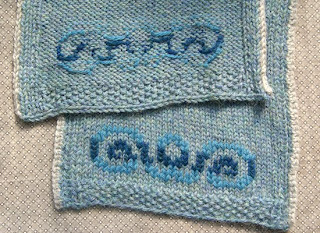 Duplicate stitching is an invaluable technique with multiple applications for knitters. 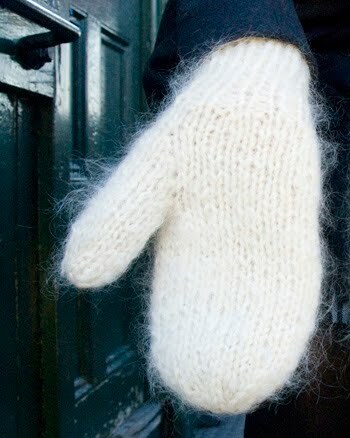 I've used it to cover up mistakes, to embellish plain stockinette, and, did I say to fix mistakes? Simply put, duplicate stitching is the process by which one uses a separate strand of yarn threaded through a needle (I prefer a duller-tipped tapestry needle) to mimic the stitches on a piece of knitted fabric. 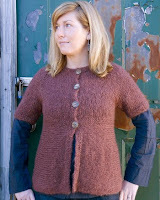 You may already be doing duplicate stitch when you weave in your ends! 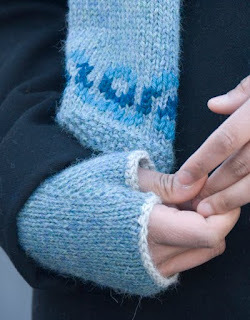 When done in large sections, the resulting "stitches" look like they were knitted there to begin with, intarsia-style. When done stitch-by-stitch, as they are in the Web Letter this week, the resulting look adds a delicate touch of color to a formerly plain knit. You can use it to add monograms or lettering to your knits also. 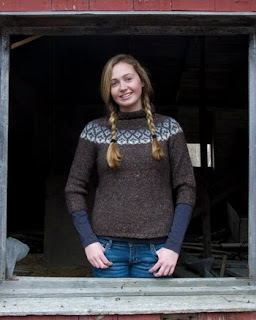 One of my favorite applications comes from Elizabeth Zimmermann, who used duplicate stitch to add names, years, or messages to the inside turned hems of sweaters. Be sure to write it upside down so the wearer can peek at it! Before beginning, examine your knitting. On the knit side, there are rows and columns of V's. You will be inserting your needle through the bottom of the V from back to front. The video below shows duplicate stitch in action from right to left and then into the row above. As always, thanks for reading! This weekend marked my last of the season at the summer cottage where I learned to knit. Lake Blaisdell is a tiny lake (158 acres to be exact) in Southern New Hampshire where my boyfriend's family has spent every summer for over 60 years, maybe even 70. 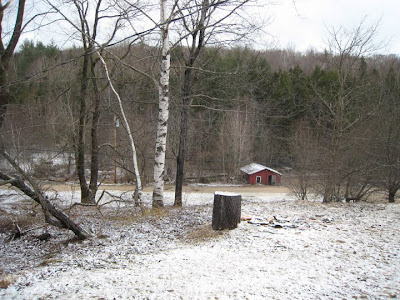 It's where his parents met as children summering together (they recently celebrated their 51st anniversary together). The families in the other cabins also summered there as children and the atmosphere is familial to say the least. Andy often calls it "the commune", only half-jokingly because we're all family there--even me, a relative newcomer. Andy's sister taught me to knit at the lake, and my days are often winnowed away on the beach, surrounded by three generations of knitters sharing laughs, gossip, and licorice from the endless candy supply brought along "for the children". Every time I pick up my needles, I'm reminded of the tradition we as crafters keep alive, not only in my family, but in the world at large. Who taught you how to knit? We want to hear your stories! Mohair has all the wonderful qualities of wool: It is flame-retardant, soil-resistant, and can absorb moisture without feeling damp or cold. It is also warmer and stronger than wool, with larger, flatter scales that contribute to an overall silky-smooth appearance. The fiber absorbs dye readily and, thanks to the smooth surface, reflects it back brilliantly. With that endorsement, who wouldn't want to knit with mohair? Also, the best thing about knitting with mohair in general, and La Gran in particular, is that it works up quickly and is very forgiving to uneven tension. The haze camouflages uneven stitches beautifully. 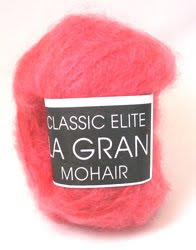 La Gran is an aran weight yarn composed of 76% Mohair, 17% Wool, and 6% Nylon. The recommended needle size is a US 9. 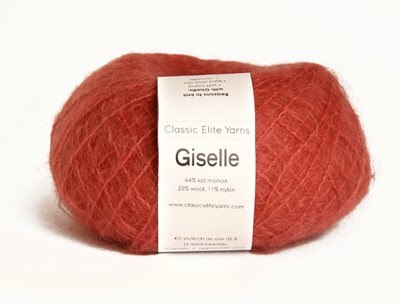 The strands of yarn feel significantly thicker than Giselle, so its designation as an Aran weight yarn tells us that its meant to be knit at a denser gauge than Giselle...and rightly so! 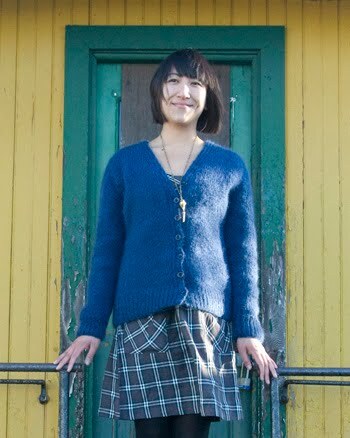 A look through the Patternfish archives and Ravelry show La Gran knit in intarsia and fairisle, cables, and elegant stockinette. Mohair before its brushed has a loopy quality; though La Gran is brushed, there's a sort of fluffy crimpiness in the yarn that reminds me a little of bouclé. 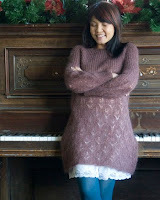 You'll find La Gran inspiration in the Saturday Afternoon, Winter Whimsy, Winter, First Edition, Luxe, Curvy Knits, vol. 2 and Depot booklets. Happy swatching! 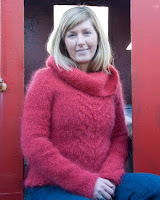 Vogue Knitting's Magic of Mohair contest is in full swing! 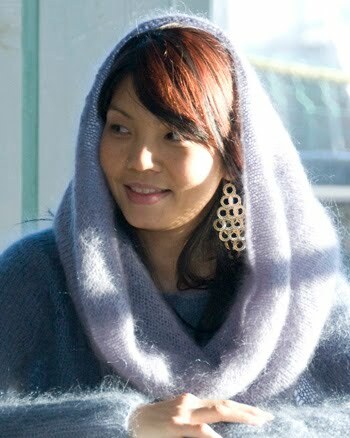 Vogue Knitting is holding a design competition this fall for all aspiring designers and design students. 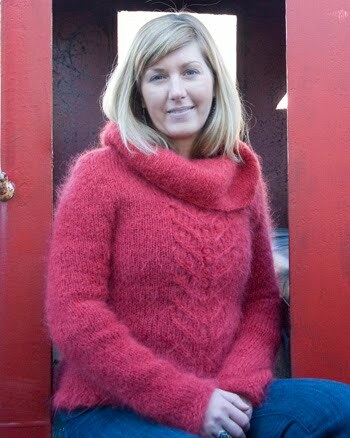 The rules are simple: submit a handknitted women's fashion garment in yarn that is at least 25% mohair and you could win! Prizes vary from gift cards and knitting supplies to the GRAND PRIZE, an all-inclusive weeklong trip to South Africa sponsored by Mohair South Africa to learn firsthand about the mohair industry, including a tour of a working mohair farm and processing center near Port Elizabeth! Also, the winner's design will be featured in a future issue of VK and will be displayed at the VKLive event this winter in New York. With such extravagant prizes in the balance, we thought we'd give out some mohair ideas for you budding designers to get your creative juices flowing. 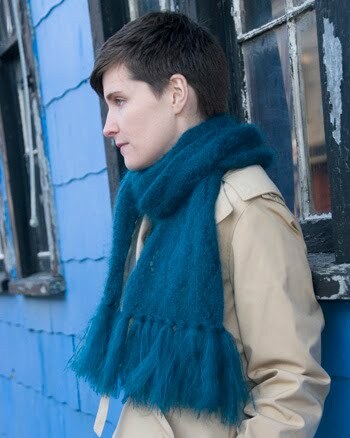 The objection I hear most often about mohair is, "It's scratchy." While I've felt my share of scratchy mohair, it's important to understand why some may be scratchy and some soft enough to keep next to your skin. Have you ever seen the term "kid mohair"? Mohair varies in softness depending on the age of the animal: the younger the goat, the softer the hair. When I picked up the ball of Giselle to swatch for this post, I was mesmerized not only by its jewel-like color, but also by its softness. I rubbed it between my hands and then, curious, against my face and neck. It's a blend of 66% kid mohair (hence the softness), 23% wool, and 11% nylon; the nylon acting as a binder, holding in all the beautiful fluff that's particular to the fiber. When looking closely at my peacock-blue ball of yarn, I noticed the thin nylon ply holding it together and was delighted to see that it's green! The contrasting nylon binder adds dimension to the already brilliant, prismatic color. Giselle is a "bulky" yarn, the recommended needle size is a US8, though the yarn itself feels quite thin. Why the beefy needle size? 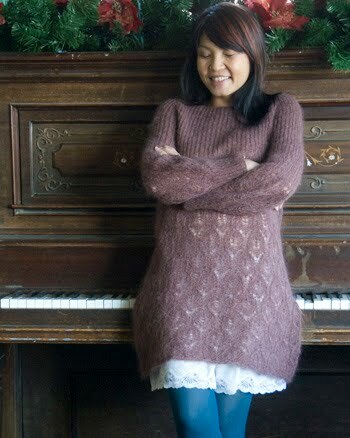 Because Giselle is meant to be knit as a soft, airy fabric, with plenty of space between the stitches. Last week was hot, hot, hot and I knit my swatch with my ceiling fan on--the strands are so light I had to wrangle them out of the air beside me. I love Giselle in stockinette stitch and delicate, ladylike lace and eyelets. I swatched it here in a horseshoe eyelet pattern from Barbara Walker's Treasury of Knitting Patterns, and I have to admit, I couldn't get a good picture of it to save my life...I hope this one shows off the pattern and the beautiful haze. See it in our Fall collection on our website and get inspired by our Heavenly and Weekend booklets! Stay tuned for a La Gran post tomorrow. Thanks for reading!